If you have been told you need a root canal, you have come to the right place. At Soft Touch Dentistry, we provide painless root canals as well as a full range of preventative, restorative and cosmetic dentistry. We have a dedicated team of professionals led by a qualified and experienced dentist, Dr. Sarah Thompson. You can trust that when it comes to root canal therapy, we deliver the effective family dental care you need in the caring, stress-free environment you deserve. At Soft Touch Dentistry, we utilize the latest dental technology and advanced technique when offering root canal therapy. A root canal procedure is used to treat and save a tooth that has become infected. Untreated decay, cracks, chips and trauma can all cause a tooth to become an infected. This results in an infection in the surrounding tissue and often a painful abscess formation. Dr. Thompson can deliver effective root canal therapy, a procedure that involves the removal of the tooth nerve and pulp followed by a thorough cleaning and sealing of the root canal site. Root canal therapy prevents further tooth and gum damage. Remember, root canals are not painful; however, an infected tooth is extremely painful. 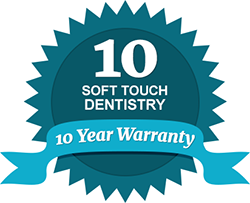 Soft Touch Dentistry proudly delivers painless root canals as well as other restorative procedures, including extractions, crowns/bridges, dentures and more. At our practice, you will find that your comfort is our priority from the moment you walk in our doors. Not only do we offer relaxing amenities and chair side patient education videos to keep you comfortable and well informed of your procedures, but Dr. Thompson is also among the elite 5% of U.S. dentists that is licensed to perform IV Sedation. Soft Touch Dentistry has a full range of sedation dentistry options, including Nitrous Oxide (laughing gas) as well as IV sedation to keep patients free of pain during their root canal procedure. To learn more about our painless root canals, contact Soft Touch Dentistry. We are known for delivering superior, personalized dental care in a warm and positive environment. Our office is currently accepting new patients and we work with many dental insurance providers. For your convenience, we also offer flexible payment options and financing plans. We look forward to helping you achieve and maintain a healthy and beautiful smile.